I learned third-hand that they were expecting — a couple I have a longtime relationship with but am not especially close to. The day to that point had been harrowing, issues with my kids and then a writing critique group with a story about a miscarriage. As soon as I heard, I cringed. She’s only a few weeks along. After Emily died, I immersed myself in the world of infant loss, devouring every book and account I could get my eyes on, creating Emily’s website and eventually leading an infant loss group. About a year later, a friend announced her pregnancy, and I felt this deep dread. I can’t describe it any other way. It was a deep dread, an instant objection (“Why would you do that to yourself?”) and an interior cringe. Two months later, she lost the baby. Another friend announced, and I was fine. That baby’s in fifth grade now. Another friend announced, and again that deep, deep dread. That baby died. Over and over, this happens. I’m honestly too tense right now to believe that instant cringe qualified. But sometime in the intervening years, I’ve decided footwear is a talisman of good health for a baby and every baby needs one. So I downloaded a pattern and started to knit. I know this is nuts. I know baby socks don’t fix actual problems. But I will never forget driving up DW Highway in Angeltown and feeling a compulsin: Buy K’s baby a book. NOW. NOW. I was right near B&N, so I went in and bought a couple of little somethings. I got home and there was that copulsion: Call K now. NOW. So I called and said, “I have a gift for you. Can I drop by?” and she said, “Actually, I started bleeding this morning. I’m going to the doctor in an hour.” So instead of chatting over tea, I told her what to expect at an ultrasound and talked her through what her options were for disposal of her baby’s remains. And I will not buy books for an unborn baby again. I wrapped the little board books and went over afterward, to look at ultrasound pictures of an empty sac, a perfect zero, and I will never buy another unborn baby books. 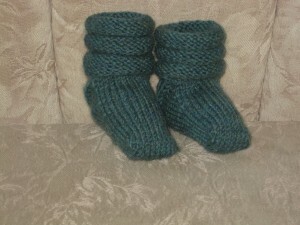 So I knit like the wind, and now I have these. 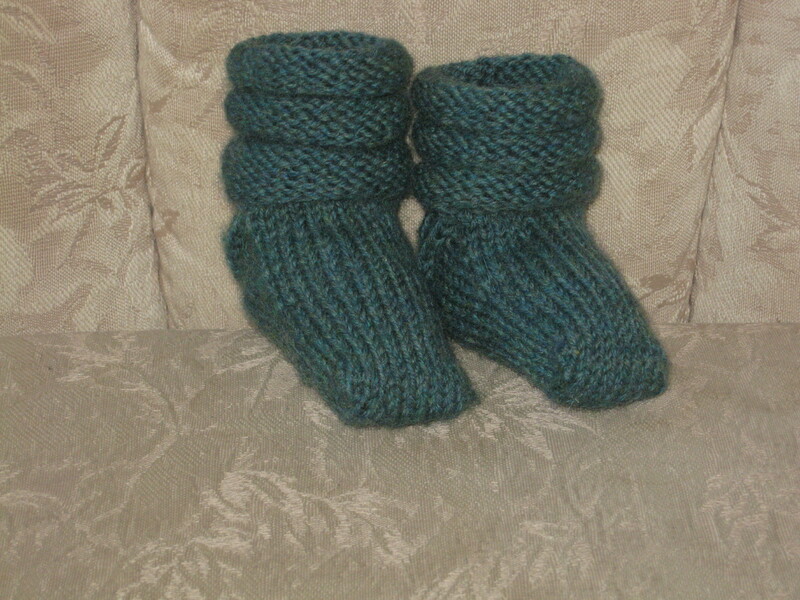 They’re going into a box because baby socks are a talisman of health and they’re the perfect emblem of love because only someone who loves you cares if your feet are warm and comfortable. They look like socks, but it’s really a box of love. Yes. Yes, the most fragile and perishable thing in the world. Liquid, something that fills every bit of its container as high as it can reach. Yes to all these. It’s all so fragile. But it’s also the strongest thing I can possibly imagine, indestructible and eternal and all of it in this box. So how to answer? “It’s just a pair of baby booties.” Let him make of that what he wants. Oh, Jane… What a beautiful post. Prayers for your friends and their baby.